Tiffany's feet, unfortunately, get the better of her. She steps into the dance, and dances with the Wintersmith, and gets some of the traits and powers of Lady Summer tangled up in herself. The Wintersmith thinks he has fallen in love with her. This is, of course, is a problem for everyone, especially when the Wintersmith wants to marry her and cause Summer to never come again. 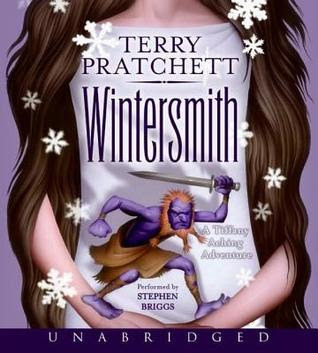 The Wintersmith has no real idea what being a person is all about, or why Tiffany is upset about the lambs dying when a blizzard hits too late in what should be spring, or why she doesn't love the ice palace he's made to lure her. The second half is a Discworld take on Orpheus and Eurydice, and both Tiffany and the local lord's son she rescued from the elf queen's court previously, take a few more steps toward adulthood. It's a fine taste of Pratchett, and a nice surprise for me to find it, when I thought there wasn't anything more.